The GPO Stylo 3 speed stand alone vinyl record player with built in speakers is a lovely example of a classic, retro record player which will let you listen to your collection of vinyl records in style. It is a modern machine too, with ports on the back which will allow you to plug an MP3 player or headset in as well. The GPO Stylo looks attractive, something that is important to all audiophiles. It will fit into any room and the built in speakers will allow you to enjoy the music while looking good as well. It is available in both black and red colours. The GPO Stylo 3 speed stand alone record player allows you to listen to vinyl records at 3 speeds - hardly surprising given the name! Older records can be enjoyed at 78 speed, regular LPs are at 33 and singles are played at 45. The GPO stylo 3 speed stand alone vinyl record player scores pretty well in the reviews, achieving an average of 4 out of 5 on Amazon. Paul said, "I purchased this lovely compact little unit as a gift, it plays all the speed 33 / 45 / 78s which is fantastic. They love the retro style, cool LED indicator and fantastic sound from 2 speakers. Probably the best gift purchase for a long time." GB said, "Looks great, plays great. Does everything that it says it will. Really enjoying listening to my old LPs. Highly recommended product." Lori said, "Received the GPO Stylo this morning and I love everything about it. It is absolutely worth every penny and the sound is fantastic. I would recommend this to anyone." Soap said, "The GPO stylo is a nifty little record player and at £40, it is the cheapest vinyl record player I could find." The GPO Stylo is an affordable and high quality choice for anybody interested in buying a new vinyl record player. It looks good, it sounds good and it gives real value for money. There is very little to say against this excellent product. "Jive Record Deck and More"
Here a more recent solution a record deck that allows you to play your music and even make a digital copy of it. It also has a radio and a CD player, so a complete audio system, should you want more than just an MP3 copy add one lead and a PC and you can. While it is sold as 'Retro' in many ways it is bang up to date. It is creamy white in colour with a clear Perspex lid, the feet are chrome coloured. While it has a twelve page manual all in English the layout could be better. Diagram with numbers on the right hand page and then the key on the left hand page to follow. A different method used to make a digital copy of an LP track to that of a CD track but they both work and I suppose for anyone with LPs they cannot play the 128mbps that it copies at is far better than nothing. Last moan for now there is a clock which can display in 12 or 24hour mode and this is easy to set. It cannot however keep the time if the standby power is removed and as it has no date feature any tracks you record get a date stamp of 1st Jan, 2009. However after my initial tests I went deeper into the outlets available and found with the addition on a RCA to 3.5mm lead you can with the addition of a PC and some music software like the excellent free Audacity offering you can make excellent .Wav copies and then burn then to a CD so your vinyl can now to played on a CD player. The weakest link I found was the FM radio with the wire aerial extremely sensitive and while I got stereo on a few stations most were not. The unit has a built in speaker which gives a good sound and is also useful when transferring tracks via PC as Audacity is sometimes less easy to setup to monitor what you are recording. It is 31x30x17cm, these figures are with RCA leads in the sockets on the back without them you can deduct 2cm from the middle figure the depth, however you will probably need 7cm clear behind the unit to raise the Perspex lid to 45degrees. The Perspex lid has an area in the back of the lid 17cm long and up to 3cm high that is cut out so a 12inch LP can play with lid up or down. This of course has one drawback dust. There are 15 buttons in a strip to the right of the turntable which control everything. There is also a small 15 button remote control that duplicates a lot of the tasks. The record deck can play 33, 45 or 78. I do not have any of the latter so that was not tested but as the stylus supplied does not have another side I suspect playing 78 would soon finish it. The method to make MP3 copies of a track or a whole side of a LP is straightforward. To do the same for CD is a little more complex but is correctly described in the manual. You can also connect external speakers and or an external amplifier to the unit via RCA leads. While I have described several failings I liked the unit and most of the problems are liveable with. The ability to rip WAV files with the addition of one lead and some free software take this to a higher level. I copied some MP3 files from LP to a memory stick which you can either play on the stick on the unit or on your PC; you could even burn an MP3 CD which the unit will also play. I also added the lead and Audacity software d made CDs from LPs using a PC. Perhaps best of all even with less than pristine LPs the sound was good and few clicks and hisses transferred to the WAV files. So good turntable, good CD player, so so radio but with a decent internal speaker and RCA sockets the chance to burn CDs from LPs make this something useful to many who still have vinyl collections but no way of playing it. 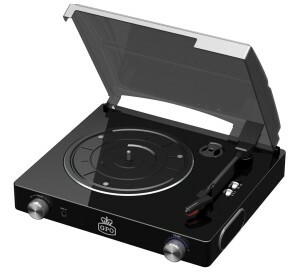 The GPO Jive Turntable is available from the link below for £189.95. They also do replacement stylus for £9.95. "Retro-futuristic record player by GPO has got us in a spin"
We like a bit of tech here at the Fizz, especially when it solves a problem with effortless style. Anyone who still has a box or two of trusty vinyl records collecting dust should take a look at what must be the smartest turntable we've ever set eyes on, designed by retro Brit gadget lovers GPO. The GPO 'Jive' has a radio, CD player and remote control on board, but it also converts your old platters into MP3 files and transfers them directly to USB. It offers three speeds, 45, 33 and 78 rpm, which means everyone from Billie Holiday to Blondie can join the digital age. And with its cute Space Odyssey styling, we think it's totally Fizztastic!